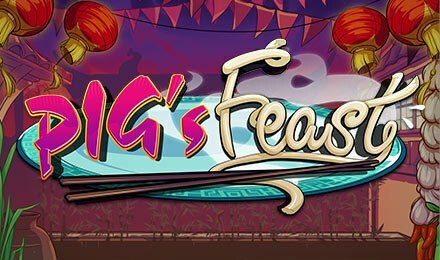 Fun-filled celebrations are awaiting you on Pig’s Feast Slot at Vegas Spins! Meet a chubby pig whose appetite matches his size on this Eyecon creation. Endowed with 5 reels and 25 lines, the game revolves around Chinese culture which considers pigs as symbols of luck and wealth. So, it goes without saying that the fat pig on this game symbolises abundance! Pig’s Feast Slot is set against a colourful backdrop with cartoonish graphics. In the background, you can see red lanterns and celebratory buntings. Join the chubby pig for a delicious feast for Spring Festival while spinning the reels. The delicious symbols you can find are Rice Bowls, Hot Soups, Teapots and Dumplings, along with the male Pig and Lady Pig. Load this marvellous game at Vegas Spins using any type of device! Get ready for the party on Pig’s Feast Slot! Begin with the game by toggling the “Coins” button and pick your desired bet value. Clicking on the Spin button sets the reels in action. Land at least 3 matching symbols to be awarded a win. The Auto Play feature is also there for you to choose a number of rounds played on their own. Bet Levels: Bet levels are unavailable on Pig’s Feast Slot. Amount of Paylines Selection: All of the 25 win lines are active. Coin Values: The different bet values range from 1 to 50 credits per line. It is not surprising that the Pig symbol stands for Wild on Pig’s Feast Slot! It substitutes for any symbol in winning combinations, except for the Lady Pig. When it participates in a winning combo, it also doubles the payout. Watch out for the Rice Bowls! These stack up on the reels of Pig’s Feast Slot. When they reach the top, fireworks are generated and random multiplier amounts are unveiled. With a minimum of 3 male Pigs appearing on the reels, the Free Games feature is launched on Pig’s Feast Slot. Three, four or five such symbols trigger 15, 20 or 25 free games, respectively depending on the selected dumpling during the Prize Pick Feature. Time to enjoy the Prize Pick Feature on Pig’s Feast Slot! It is launched when 3 or more Lady Pigs appear. During the feature, you can see the Lady Pig holding a platter filled with dumplings. Select any of these delicious goodies to earn a prize of up to 100x your triggering bet. Plus, obtain 2, 3 and 5 picks when 3, 4 and 5 Lady Pig symbols show up, respectively. Join the celebrations at Vegas Spins and launch Pig’s Feast Slot. Be ready for a fantastic time and best of luck!